Working as a "surgeon with metal," welder Archie Andrews has high-level skills that companies along the industry-rich Gulf Coast compete to employ. Earning $30 per hour in contract jobs in addition to his full-time job at CBI in Texas City, Andrews owns his own truck and equipment and has found that welding jobs abound. “I didn’t see myself (two years ago) making $5,000 a week like I am now. It all started at College of the Mainland,” said Andrews, who gained the skills he needed to succeed in roughly a year in COM's welding certificate program. According to the American Welding Society, 200,000 more welders will be needed by 2019 due to retiring Baby Boomers. With job openings outpacing new welding graduates, some COM students complete a few courses to gain the skills needed to test into an entry-level job. They then finish the welding certificate program by taking classes at night to prepare them for advancement in the field. COM’s program has no prerequisites and is ideal for “anyone with hand-eye coordination who doesn't mind sweating. If you can sew, you can weld,” said Miller. Though traditionally a male-majority field, the welding landscape is changing, fueled in part by companies seeking to meet the male/female ratios required to receive federal contracts. “The demand for women in welding is unbelievable,” said Miller. Welding jobs abound in oil refineries, construction companies, shipyards, pipeline companies and fabrication shops and as an independent contractor, especially if a welder has his or her own equipment. Pipeline welders earn the highest wages and their jobs often involve travel. COM's program trains students with any level of welding experience, from those who have never held a blowtorch to those wanting to enhance their skills and advance in the field. “We find out where students’ skills are and take them from there,” Miller said. Working with students of all ages and backgrounds, Miller has found that welding is a universal language and has taught students with limited English skills to master the precise skill. Noncredit classes offering solely hands-on instruction begin every Monday at COM. 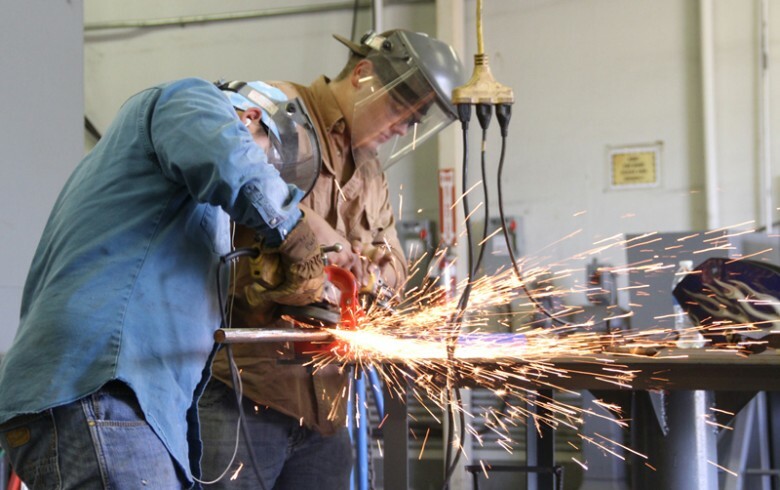 Credit classes provide both textbook and hands-on instruction in four types of welding – gas metal arc welding, shielded metal arc welding, gas tungsten arc welding and oxy-fuel welding – and lead to a certificate within one year. Andrews is one student whose life changed when he came to COM after trying and quitting two colleges. For more information about the credit or noncredit programs, which begin throughout the year, contact Doc Miller at dmiller@com.edu or 409-933-8454 or visit www.com.edu/welding. College of the Mainland welding graduate Archie Andrews, right, often earns about $5,000 a week as a welder. 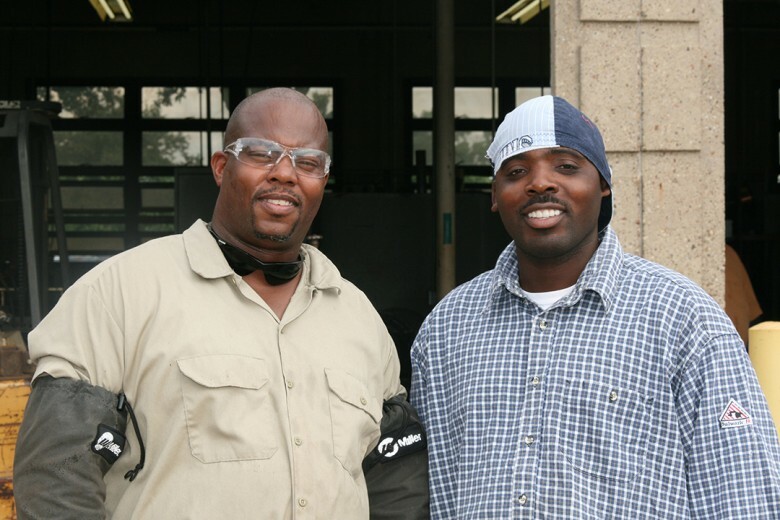 He frequently returns to thank COM welding instructor Victor Woods, left, for his giving him the knowledge and support he needed to succeed in COM’s one-year program and in the workforce.